I've come across so many wonderful looking recipes requiring matcha green tea, but I just couldn't bring myself to buy any. It's always $10 - $20 for a small container, and I had no idea how much I would use, if I would like it or if it was cost effective to own. For years I debated buying some until I found a small bag for 4 bucks at Mitsuwa! Yay! Debate over! I bought some. Turns out I LOVE it and it can be very cost effective. Due to genetic heart problems, my body started rejecting caffeine late last year. I've had to significantly cut down my caffeine consumption and I was worried about matcha green tea giving me heart palpitations. Lucky for me, there's no need to worry (at least for the time being!) I won't get into the nitty gritty details about MGT because I'm still learning, but I am going to link to a few helpful articles that I hope you read if A) you are skeptical about buying MGT, but are considering it B) you can't drink a lot of caffeine, but really miss it or C) have some in your pantry for baking, but haven't made a cup for drinking. 1. 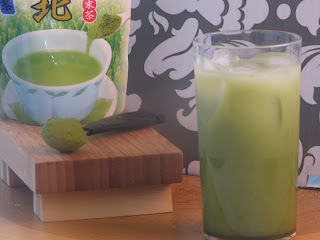 Mix matcha green tea powder with water until completely dissolved. Stir in sugar. 2. Add milk and vanilla and stir well. Optional: If drinking warm, just heat milk with water. Be careful not to boil!